Vulnerability Scan Service (VSS) is a security diagnosis service that uses weakness detection and intelligent correlation analysis technologies to help discover security risks in your websites or servers. Scans for website, host, and middleware vulnerabilities, as well as weak passwords. Monitors the latest network vulnerabilities in real time, updates detection rules immediately, and detects asset risks promptly. Harmless scan dynamically adjusts scanning frequency and analyzes how detection results are correlated. In compliance with Huawei and Center for Internet Security (CIS) benchmarks, checks for configuration weaknesses to expose vulnerabilities. Website vulnerabilities can lead to crippling impact on business and cause financial loss if not found and addressed at the earliest possible time. Incorporates a vulnerability rule library for scanning all types of websites and produces comprehensive scan reports. Security experts analyze the latest critical vulnerabilities and update rules to provide the fastest and most complete CVE vulnerability scan. Hosts bearing critical services may be exposed to vulnerabilities and non-compliant configurations. Performs multi-dimensional OS vulnerability detection and configuration checking. Enterprises can choose to enact an intranet scanning policy on servers. Passwords are usually used for remote login to assets such as hosts or middleware. Attackers often use scanning technologies to hack usernames and weak passwords. Scans for standard web services, all OSs, and 90% of all middleware, including databases. Simulates hacker detection of weak passwords. You can also use your own weak password library to detect passwords. Middleware helps develop and integrate complex application software flexibly and efficiently. If a hacker discovers and exploits vulnerabilities in the middleware, the security of the upper layer and lower layer is compromised. Supports vulnerability scanning of foreground development frameworks, and background microservices, as well as configuration compliance scanning. Chooses standard scan or custom scan to identify the middleware and its version in the server, and discover vulnerabilities and risks. Non-compliant content on your site can stain your brand image and lead to financial losses. Synchronously updates sample data from hot topics in politics and public opinion, and accurately identifies inappropriate and illicit content, including violence-related, terrorism-related, and politically sensitive information. Performs semantic analysis on texts and images to identify complex texts. Enables specialized vulnerability scanning of assets, including web applications, hosts, middleware, and weak passwords. Monitors the latest network vulnerabilities 24x7, updates scan rules at the earliest possible time, and rapidly detects vulnerabilities in your assets. Monitors the latest high-risk vulnerabilities and your important assets, locates the affected servers or websites once a high-risk vulnerability is discovered, and provides detailed recommendations for resolving potential security issues. The scan engine adjusts the scan speed based on site load, ensuring service continuity. Harmless scanning prevents dirty data from being written into your databases. Identifies inappropriate and illicit content to protect your brand image. In compliance with Huawei and CIS benchmarks, checks for weaknesses in security configurations to expose vulnerabilities. Quickly and accurately detects non-compliant content using deep learning technologies and a large set of sample libraries. Stays up to date on any breaking news and quickly updates the detection library. VSS has been tested and used over the years across a variety of complex scenarios. Checks whether the password complexity and password policy of server accounts meet profile requirements. Checks whether baselines comply with Huawei and CIS benchmarks. Checks high-risk configurations of databases such as MySQL and MongoDB. Generates a comprehensive scan report with detected vulnerabilities classified and provides the recommended actions to improve site defenses. Customizes scan parameters based on your needs. Provides detailed information, including URLs, vulnerability names, and descriptions, that can be downloaded to a local PC. Classifies vulnerabilities by severity and provides recommendations on how to fix each type. Chooses the method best suited for you to log in, such as using the account and password or cookies. Selects specific plugins so you can scan specific types of vulnerabilities and quickly identify risks. Sets the crawler user agent (UA) and excludes links from being crawled, enhancing scan security. Customizes the start time of a scan, helping you avoid performance bottlenecks during peak service hours; creates periodic scan jobs based on your needs. Add information about the website or host to be scanned. Website assets: Enter the domain name or IP address to add a website. All websites on the Internet can be scanned. 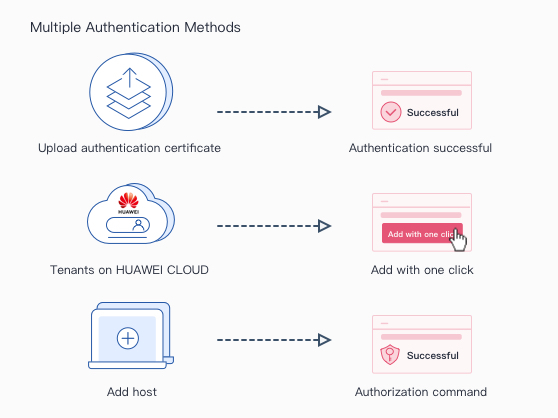 Host assets: ECSs on HUAWEI CLOUD can be added in one-click. For a non-huawei cloud host, enter the IP address of the host. You must authenticate ownership before scanning. Select the most appropriate authentication method to simplify your operations. Scan websites and hosts from multiple dimensions to discover vulnerabilities. Consider how an attacker would try to hack your assets and perform complete scans, leaving no risk addressed. Scan with one click using default settings or configure more settings to perform a more detailed scan. You can start a scan job immediately or set a periodic scan job. View the scan results and download the scan report. You can view the scan progress in real time. As soon as the scan is complete, you will be notified by SMS or email. Then, you can download the scan report with the recommended mitigations provided. Prevents threats including web attacks and webshells. Provides great defense capability and flexible protection.